There are more than a few undignified ways to meet your maker, and dying while doing housework might top the list. 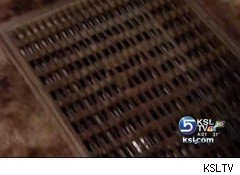 One Utah woman narrowly escaped such a fate after falling headfirst into a heating vent -- and getting stuck there for over 30 hours. The 5'7" and 110-pound Margaret Wright's three-and-a-half foot drop into her floor vent may have been small, but it could have been deadly. She slipped while cleaning the vent out with a vacuum hose. After spending more than a day in the vent, Wright was discovered by firefighters after a relative became worried about her absence. When rescuers arrived, they heard her calling for help and found her feet sticking out of the vent. When she was finally pulled out, Wright was dehydrated, her legs were purple and she had a number of cuts and bruises. how does a 110 pound woman get stuck?? its not like she was one of my 210 pound hot girlfriends im juggling right now.